I always find many very large craft-quality pieces of glass, jewelry-grade pieces, I've found 10 marbles at this beach, with my best day having found four marbles. Purple, red, pink, blue, green, brown, white and milk glass can all be found. Many pieces of pottery and dominoes. I've found a few bottle stoppers and an orange piece of glass shaped like a decanter head. 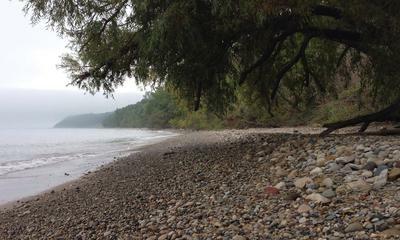 The best part about this beach are the muddy cliffs which trickle down water to the lake. This water carries with it various dissolved minerals and silt. The water runs across and through plant matter which, through calcification, turns the plants into a stone-like material. You can find many very young fossils, as well as glass that has been calcified, then subsequently beach tumbled. These beach-tumbled pieces of glass with calcification are quite rare to find, and these cliffs are a mass of calcification being eroded by the beach. 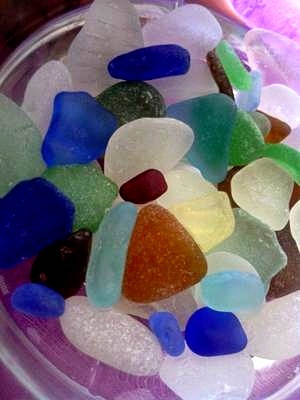 Good - 5 to 9 pieces of jewelry grade sea glass found per hour. 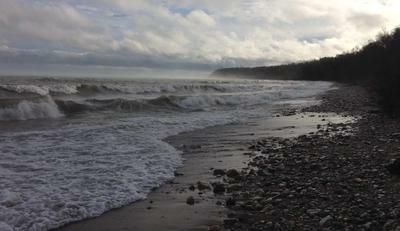 The beach is surrounded by large and muddy cliffs, which are difficult to traverse off-trail. The waves can reach to the bottom of the cliff, leaving much of the beach inaccessible during portions of the day and during storms. Despite some comments saying there are shady people and gang activity, this is anecdotal, at best. I live minutes from here and am there every couple days. I assure you there is never gang activity. The people consist of mostly backpack hikers and families and kids. The surrounding neighborhood and towns are beautiful and safe areas. Lake Glass where in Cudahy, WI? Hi, just saw the comment about the lake glass found in Grant Park in Cudahy. I'm confused as to where? 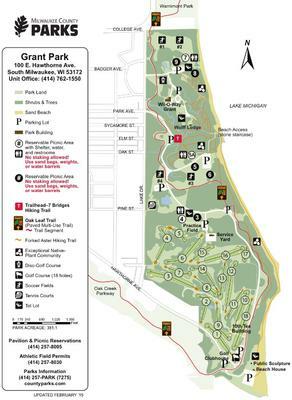 I have gone a lot to Grant Park right off the Golf Course on Hawthorne Road. That is I believe South Milwaukee, not Cudahy. Are we talking about two different areas? There is one in Cudahy where you walk down a somewhat steeper black top & dirt path to the lake. There is a small pier and very, very little beach. I found maybe one piece of glass. That's not the one you are talking about? Recently, I went into remission from a disease that has rocked my world and swallowed up 3 years of my life. Unfortunately, it will come back but before it does I want to take a trip with my 2 boys ages 15 and 21. I recently fell in love with sea glass...which is crazy because I've never even seen one piece. Only in books. I was foolish enough to spend 2 whole days in Two Rivers, Wisconsin on Lake Michigan this 4th of July with a pail for all of the beautiful pieces I planned on finding. But sadly, I only found a third degree sunburn. I live in Green Bay and although we have more cheese than we know what to do with we are NOT the sea glass capital of the world that's for sure. Since I can't go to the ocean to search. I want to search Lake Michigan. 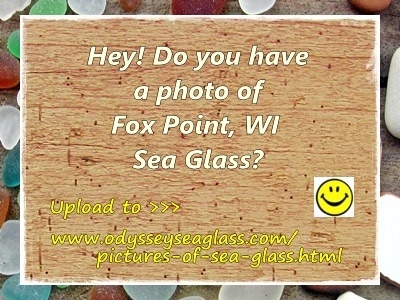 I was hoping that some of you could help me by sending me the names of the beaches where you have found beach glass. We want to go beach hopping to see what we can come up with. So please, if you have had good luck at any beaches that sit on Lake Michigan north or south could you please send me the names of them. Then I can start mapping out our little journey. I'd be so grateful. Perhaps we should! I always find some wonderful things at this beach, and I live right by Bayview. Nice marbles! I've been combing just a little but north of you in Bay View. I found 53 marbles this year but no stoppers. Maybe we should trade spots!